A new positioning system has been developed to complement or even replace current technologies such as GPS. 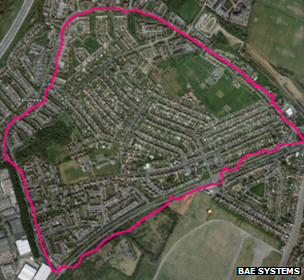 Made by UK defence firm BAE Systems, it relies on the same signals used by mobile phones, TVs, radios and wi-fi rather than navigation satellites. The firm says Navsop could help find victims inside buildings during a fire and locate stolen vehicles hidden in underground car parks. It could also be used in a war if the sat-nav system was turned off. For now, the prototype is a big box-like piece of hardware placed in the back of one of BAE's cars, which sports a radio antenna on the roof. But once out on the market, it will be as tiny as a GPS dongle is today - a bit bigger than a coin - says Ramsey Faragher, principal scientist at the BAE Advanced Technology Centre in Chelmsford, near London. "Let's be clear - for Navsop to start working, you have to have a GPS signal, to know where you are on the face of the Earth," he says, sitting in the back of the car as it drives along Chelmsford's streets. 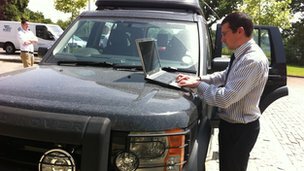 "But if the GPS signal disappears, we'll still be able to navigate," he adds, pointing to the computer screen depicting a map with a dotted line showing the vehicle's location. The device works by picking up all the available signals nearby, heavily relying on medium wave radio frequencies. This is the same part of the spectrum used by radio pioneer Guglielmo Marconi more than a 100 years ago, who opened the world's first telegraph in the same city. 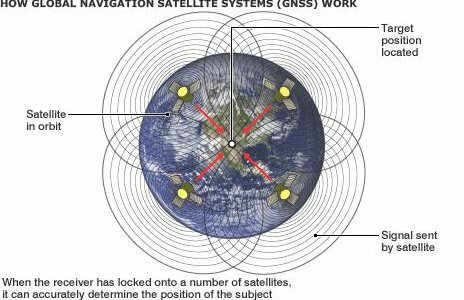 GPS (global positioning system) uses signals coming from satellites spinning around the Earth, some 20,000km (12,427 miles) away. By the time these signals reach the surface of our planet, they are extremely weak and unable to be picked up by receivers, for instance, inside buildings. They may also suddenly disappear, says Mr Faragher. "Our society has now become hugely dependent on GPS," he adds. "The European Commission determined that 800bn euros [$995bn; £642bn] of the European economy is dependent on either precision navigation or precision timing from GPS - the aviation industry, the shipping industry, agriculture, telecommunications, all need GPS to function. "And that's why it's important to have back-up systems in case GPS signal is not available." For instance, there have been cases when criminals have stolen cars and used GPS jammers bought over the internet to prevent the vehicles' owners from trying to locate them. There are also natural space events such as solar flares that result in a release of a very large cloud of charged particles, which, once they hit the Earth's atmosphere, can prevent GPS signals from coming through cleanly. But mobile phones, radios and TVs use signals that are a lot more powerful than those from navigation satellites, as they are broadcast from only a few kilometres away, and cannot be jammed. So Navsop uses them instead. "We are not saying that our technology should necessarily replace GPS, but rather complement it," says Mr Faragher. "If the GPS signal is there, by all means, use it. If not, we say that with Navsop, you can determine your position anyway." And this could be useful in a variety of scenarios - from precisely determining the position of trains in tunnels to locating victims trapped in buildings after explosions or earthquakes. 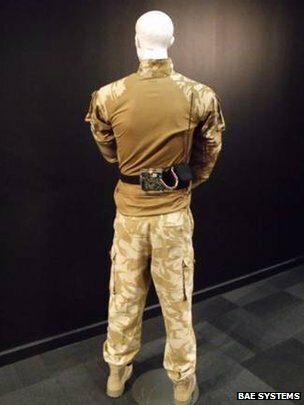 It would also be useful to the military in case one side deliberately switches off GPS to prevent its adversary from locating its units. BAE Systems says that for now, it is not clear when the technology will be put on the market, but in principle it could be used by countries developing other sat-nav technologies. Currently, Russia has Glonass, and China is building Beidou, also known as Compass. The European Union and European Space Agency are developing Galileo, a separate 20bn euro project.